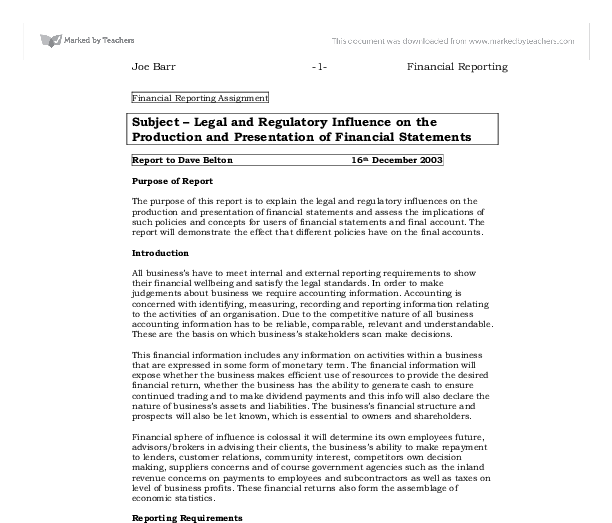 The purpose of this report is to explain the legal and regulatory influences on the production and presentation of financial statements and assess the implications of such policies and concepts for users of financial statements and final account. Financial Reporting Assignment Subject - Legal and Regulatory Influence on the Production and Presentation of Financial Statements Report to Dave Belton 16th December 2003 Purpose of Report The purpose of this report is to explain the legal and regulatory influences on the production and presentation of financial statements and assess the implications of such policies and concepts for users of financial statements and final account. The report will demonstrate the effect that different policies have on the final accounts. 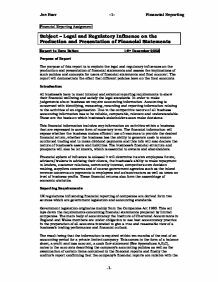 Introduction All business's have to meet internal and external reporting requirements to show their financial wellbeing and satisfy the legal standards. In order to make judgements about business we require accounting information. Accounting is concerned with identifying, measuring, recording and reporting information relating to the activities of an organisation. Due to the competitive nature of all business accounting information has to be reliable, comparable, relevant and understandable. These are the basis on which business's stakeholders scan make decisions. This financial information includes any information on activities within a business that are expressed in some form of monetary term. The financial information will expose whether the business makes efficient use of resources to provide the desired financial return, whether the business has the ability to generate cash to ensure continued trading and to make dividend payments and this info will also declare the nature of business's assets and liabilities. ...read more. Financial Reporting Standards FRS1 FRS 1 requires reporting entity within preparing a cash flow statement in the manner set out in the FRS. Cash flows (See appendix C) are increases or decreases in amounts of cash revolving within the business. A cash flow should show the operating activities, returns on investments and servicing of finance, taxation, capital expenditure and financial investment, acquisitions and disposals, equity dividends paid management of liquid resources and financing. When introduced this represented a radical change in financial reporting. However, cash flow statements had increasingly come to be recognised as a useful addition to the balance sheet and profit and loss account in their portrayal of financial position, performance and financial adaptability (in particular in indicating the relationship between profitability and cash-generating ability) and thus of the quality of the profit earned. FRS 2 FRS 2 sets out the conditions under which an entity qualifies as a parent undertaking which should prepare consolidated financial statements for its group-the parent and its subsidiaries. In general an investor that controls an investor entity is its parent and should account for that entity as a subsidiary. The FRS also sets out the manner in which consolidated financial statements are to be prepared. In the Companies Act 1985 introduced provisions dealing with parents and subsidiaries and group accounts-in particular looking at defining parent and subsidiary undertakings and content of group accounts. ...read more. There will, however, be circumstances in which a trader will bear the VAT, and in such cases where the VAT is irrecoverable, it should be included in the cost of the items reported in the financial statements. Conclusion When producing financial statements the legal and regulatory influences are vast, this report providing information only on a few of these. There importance is not to be underestimated and companies should be fully aware of there implications. The key concepts described in SSAP 2, FRS 1, 2&3, SSAP 9 and SSAP form the ideal way in which financial information should be presented and produced. We live in a rapidly changing business world, keeping up to date may be very companies short fall. The way accounts are produced and presented will surely provide short cuts and stop gaps for companies to not provide an accurate overview of their financial position but with methods ever being produced to ensure a fair reflection of companies' financial position can be only beneficial. Fair accounts make the way foreword for financial interpretation, analysis and business decision making. This report illustrates that producing financial statements are extremely relevant even in today's markets. This report will hopefully suggest that financial accounting provides investors with as much information as possible which is better than that obtained from other sources. Accuracy when producing and presenting financial statement bears the expectations based on management releases and decisions. These control mechanisms as explained in this report in all leads to the review of past management actions. Joe Barr -1- Financial Reporting -1- ...read more. One of its divisions called the UKLA (UK Listing Authority) carries out this responsibility. UKLA seeks to ensure that listed companies comply with their ongoing obligations under the listing rules. The UKLA has the power to impose a financial penalty on a listed company or director where the listing rules have been broken. Compare the final accounts of two organisations explaining the similarities and differences. The accountancy profession The accountancy profession has published statements recommending the disclosure of specific data, however, in its role as regulator, the accountancy profession has been even more influential in achieving a significant increase in the comparability of financial statements. + You can see your balance reduce over the years. Disadvantages of a capital repayment mortgage Very little capital is paid off in the early years of the mortgage. - Nearly 50% of the capital will still owe after 18 years on a 25 year mortgage. For my business J.G.WASHES my profit and loss account shows that I made a profit of £85.33 in my first year of running my business and I didn’t take out any money so this fall amount stayed in my business.